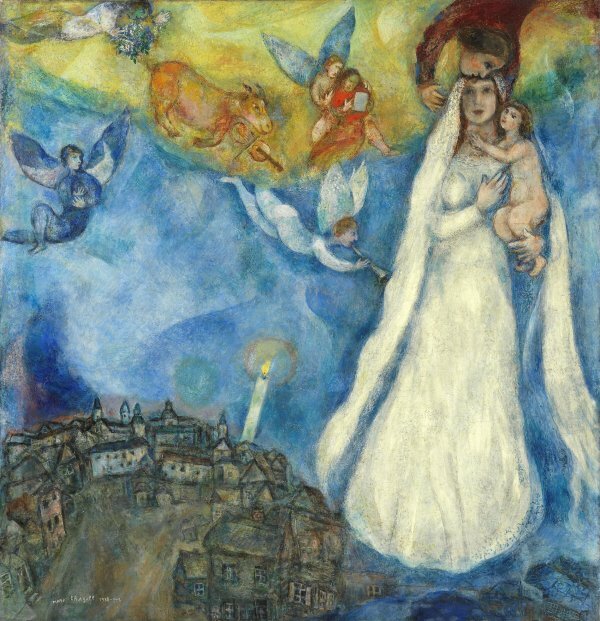 During the years of the Jewish holocaust, Chagall painted numerous religious scenes taken from the Christian tradition. He produced a Crucifixion in 1938, and started on The Madonna of the Village in the Thyssen-Bornemisza collection soon afterwards. In 1940, while living temporarily in the Provencal town of Gordes, to which he had fled to escape the menacing Nazi advance through Holland and Belgium towards France, he continued working on this ambitious canvas and repainted some of the areas that were already sketched. The painting was not entirely completed until 1942, while the painter was staying in New York. The painting in its final state shows a Madonna holding the Child in her arms, surrounded by angels singing and playing music accompanied by a flying cow with a violin. The scene is set near a small village. The Madonna, rendered on a monumental scale and wearing a bridal gown, floats in a fantasy world that is so characteristic of the painter.